From students in a Cambridge high school to a rally in Waterloo, people are taking part in events to show solidarity with the March For Our Lives in Washington, D.C., on Saturday. Some students at Preston High School in Cambridge spent their lunch break listening to speakers and having a moment of silence to show solidarity with American youth angry about guns south of the border. 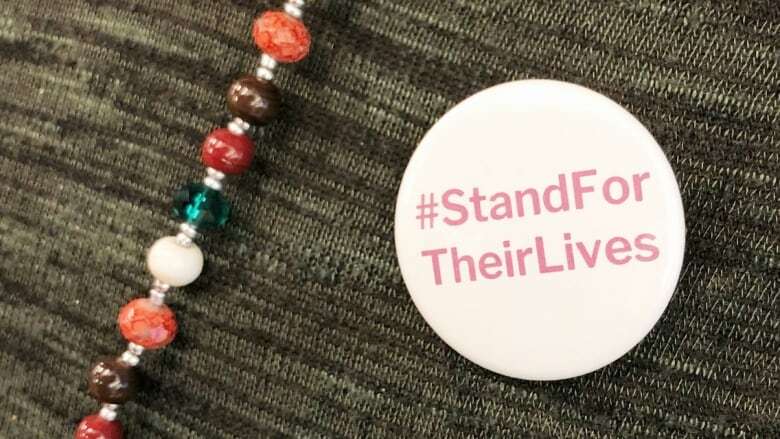 The event Friday afternoon was called Stand for their Lives, and it was to mark the March For Our Lives planned for Saturday in Washington, D.C.
"This is an opportunity for us to have an impact in raising awareness toward the youth in America and we want to support them in their efforts and hard work," said Daisy Nguyen, 16, a Grade 10 student at the school who worked with Grade 11 student Riley Porter to plan the rally. 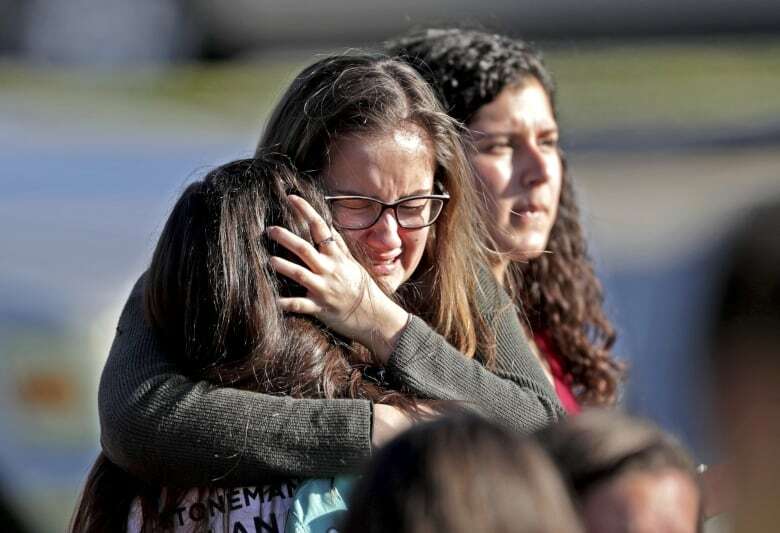 "We were just so inspired by them," 16-year-old Porter said of the students of Marjory Stoneman Douglas High School in Parkland, Fla. The students at the Florida high school have been speaking out about gun violence after 17 people were killed and 17 more injured after a classmate fired gunshots in the school on Feb. 14. "They're youth just like us and they're using their voices to change something," Porter said. That's an important piece of the march and the current movement, Nguyen said. "Sometimes [for] youth, people believe that our voices don't matter because we are so young. But it's the fact that these youth aren't being silenced and they are taking a stand and they have the courage to fight for what they believe in," she said. 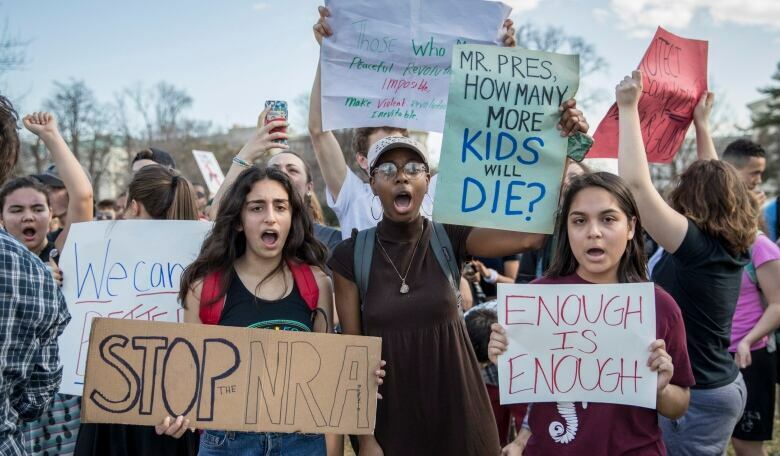 The young people who are standing up to powerful organizations like the National Rifle Association (NRA) is interesting to Tom Schaller, professor of political science at the University of Maryland. Can a boycott of Canadian companies actually hurt the NRA? 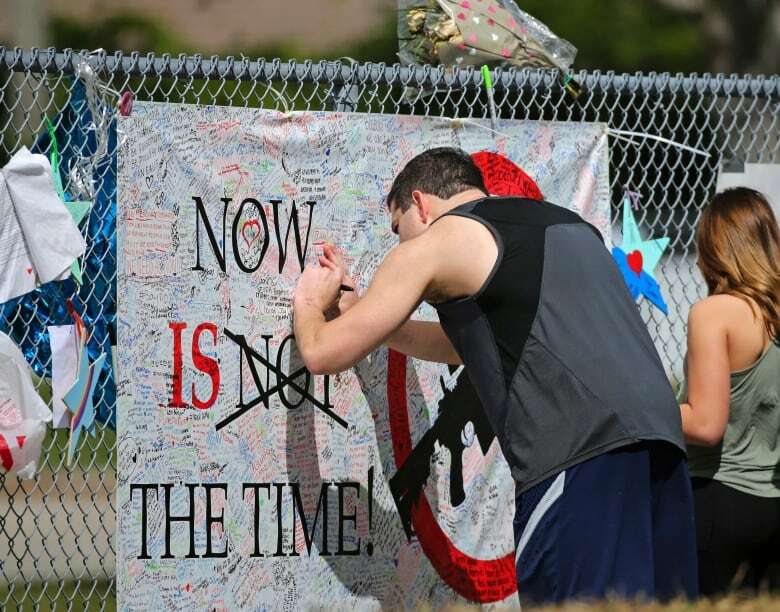 The Parkland school shooting was not the first, or even the biggest, but there was a perfect storm of the age of those involved and the technology in their hands. "The technological platforms available to young people today changes the nature of it," Schaller said. He noted for the most part, young people don't participate in politics. But here they are now, calling on congress to make changes. "This is very surprising to observers of politics and political scientists like me," he said. While Saturday's march will receive media coverage and will get some attention, Schaller said it will be interesting to see where things go from there. For instance, if it will affect the 2018 midterm elections in the U.S.
"The big thing to see is, will these young people, will they register, will they vote, is it a lasting thing after Saturday and what will be the lasting impact in terms of actual policy change," he said. There are three rallies being held in locally — Stratford, Guelph and Waterloo — to mark the Washington, D.C., march. Peggy Coffey of Stratford said she was devastated after she heard of another shooting in the U.S.
She thought about turning her back to the news, she said. "And then I heard the young people speaking and it was that that made me want to do this," Coffey said. "These kids deserve to have adults stand beside them, deserve to be safe." Rupinder Mangat is organizing the rally at Wilfrid Laurier University and said the event will also remind people there are problems with guns here in Canada. But she said it is possible to make a difference — people just have to believe it can happen. "We have to work really hard to get there. I think it's easy to give in. It's easy to say, 'Oh well, nothing's going to change,'" she said. That's why she finds the Parkland students so inspiring, she said. "This issue of gun control — pretty much everyone for the last few decades, we've been hearing the gun control issue is dead," Mangat said. "Then suddenly these kids just said, 'You know what, enough is enough,'" she said. "They've suddenly energized the whole nation. They've reignited the debate."